My favorite way to eat homemade honey vanilla yogurt--with fresh blueberries and baby bananas. When I found out how to make my own yogurt, I got excited. Not so much about the making of the yogurt, but more about the idea that my first batch will continue to breed more and more yogurt indefinitely, and that the yogurt I will make years from now will still contain a little tiny part of my original one. It’s been about six months since my last store bought yogurt, and I’ve had yogurt in my fridge every single day since then. Crazy it maybe, but I’ve developed a bond with it—kind of like keeping a pet—cute little bacteria pets. After the first few months of yogurt making, I felt a strange sense of responsibility for the survival of their clan, I mean, if I eat it all without saving any to breed more yogurt…that would be it. I would’ve killed them all…forever. Now, if bonding with your food isn’t enough to convince you to make your own yogurt, consider this: It’s cheaper. Volume per volume, milk is much cheaper than yogurt. Firstly, you need to buy the last tub of plain yogurt you’ll ever buy as your starter culture, so go all out: natural, organic, sustainably raised, free range, the whole package. Next, enjoy your tub of yogurt all you want—all but 2 tablespoons of it. These two tablespoons contain the originators of your bacteria colony. 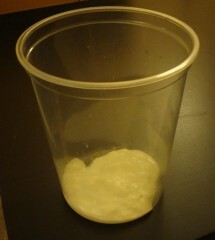 Put it into a sealable container, in fact if you bought the large yogurt tub you can even use the container it came in. All the starter culture you need to make a whole quart of yugurt. Let it cool down to 95-110 F. I recommend using a thermometer to be sure, although I’ve heard Jamie Oliver say that you can just stick your finger in, and if it feels like you’re touching nothing (i.e. the milk is at body temperature) then you’re good to go. The most important thing is not to have the milk be too hot or you’ll kill all your single-celled friends, ending up with nothing more than a milky bacterial cemetery. As it cools I like to add a splash f vanilla and/or a little bit of honey to make a flavored yogurt. Sometimes I take out some of this warm honey vanilla milk and drink it just like that. The best bedtime drink I know of! Pour a little of this milk into the starter culture and stir to dissolve the yogurt, then add the rest of the milk and stir. Close the container, and keep it still in a warm area. My apartment is unfortunately freezing and we’re too frugal to turn the heat on, making warm areas rather difficult to come by. So what I do is I turn on my oven for two minutes just until it’s nice and warm then turn it off, then I put my yogurt in the oven, wrapped in thick towels, and leave it in the oven over night. Turn the oven light on if you can, sadly my oven is from the far past and has a light that only turns on if the door is open. The warmer the environment, the faster your yogurt will set. The longer you leave your yogurt out, the firmer your yogurt will be. Refrigerate when set. There you have it, your eternal yogurt. Now you can even give your friends your culture so they can start their own, even though it’s really yours. I would recommend only giving it to serious foodist friends just to make sure they continue to raise it with as much love and care as you. Funny, I remember as a kid my dad bought one of those multi-cup Salton brand yogurt makers. It had a clear yellow lid. I also remember the yogurt being somewhat grainy and that he never used it more than twice. The next time I saw it was years later sitting on the table at a garage sale! But, now that we actually consume a fair amount of yogurt at home, and always have whole milk on hand for the toddler. I’m so going to try this. Thanks Pallin. Thanks Ben, I’m glad it helped! If I were in Van I’d give you my started culture, but alas… Make sure, I forgot to mention, you get the yogurt that says “contains live bacterial culture.” Homemade yogurt maybe a little thinner than your store bought one, because a lot of times manufacturers add thickener/stabilizer. If you want thicker yogurt just let it sit in a strainer lined with a few layers of cheese cloth to drain out some of the whey. Don’t throw out the whey, it contains lots of riboflavin (responsible for the yellow/green tint) so you can drink it. Substantially, the article is in reality the freshest on that noteworthy topic. I concur with your conclusions and will eagerly look forward to your forthcoming updates. Saying thanks will not just be sufficient, for the fantastic lucidity in your writing. I will certainly perfect away grab your rss feed to stay abreast of any updates. Fabulous work and much success in your business endeavors! I make at least 3 quarts yogurt every couple of days…. and I mean really good stuff! Today, for the first time, I was able to culture a batch of Activia in a little over 2 hours…. it is really, really good stuff. My website is devoted to making the making of yogurt a part of your family routine – and no more of these skimpy yogurt cups…. I make as much as 4 wide-mouth quarts at a time! Can I use low fat yogurt?